He’s big. He’s Scottish. And he’s over here. Extended by popular demand, Jim Lambie’s solo show is a feast for the eyes, an extravaganza, a psychedelic phantasmagoria. But what else? Jim Lambie has made a career out of dorm rooms. Specifically, your cool older brother’s room circa 1978. Psychedelic patterns in wild colors, piles of old album covers, and posters of music idols all feature prominently in Lambie’s oeuvre, though lava lamps are conspicuous by their absence. This guy hit adolescence in the heyday of punk and disco, and recovery seems to be taking him a while. “Unknown Pleasures” exhibits a series of works that Lambie and his team of assistants installed at the Hara Museum in December last year. 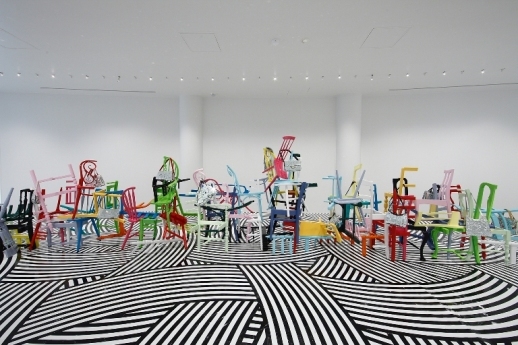 The show includes several of the Scottish artist’s trademarks: a vibrantly colored sculpture made of deconstructed chairs and mirrored handbags (‘Train in Vain’), a series of black-and-white posters of pop-culture idols overlaid with fragments of floral oil paintings (‘Found Flower Paintings’), multi-knobbed doors leading nowhere (‘Maybelline,’ ‘Plastic Ono,’ and ‘Kinda Blue’). And herein lies the rub. I admire some of Lambie’s work, I really do. He is a master at creating disorienting environments. But how often can an artist—especially one working in the genre of site-specific conceptual art—productively repeat a trademark move? 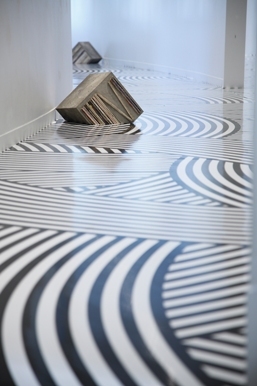 Lambie is perhaps best known for his patterned floor surfaces, which he makes using vinyl tape. In most cases, the tape echoes the outlines of the space, inviting the viewer to think about the interactions between art and architecture, two-dimensional and three-dimensional work, decoration and design. Frankly, I felt cheated by this exhibition. Over and over again, I would find myself excited about particular works, only to discover that they were not as original as they seemed. ‘I Didn’t Know I Loved You Til’ I Saw You Rock ‘N’ Roll’ – which is, to my mind, the strongest piece here – is a good example. The work consists of a mattress mounted onto the wall above the stairs. 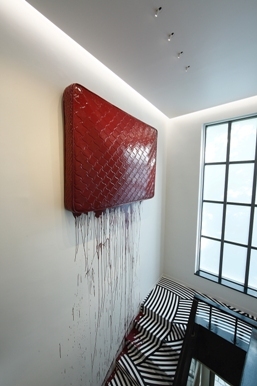 It is coated in high-gloss paint of a lurid maroon color that inevitably evokes blood as it drips down the wall and pools on the stair treads. Lambie has said that he chose to mount the piece here, where the viewer is nearing the house’s former bedrooms, because the mattress is a symbol of domesticity. Pretty cool, right? Well, yeah, until you realize Lambie has made other mattresses in other colors for other shows in institutional, not domestic, settings. Maybe I’m asking too much. Lambie is a musician and DJ as well as a visual artist, and he often draws parallels between the two worlds. Perhaps it is useful for us viewers, too, to think of him as a rock star, as David Bowie instead of Rembrandt. Musicians must often perform the same material night after night, in venue after venue, and though you always want to believe that they’re playing your favorite song just for you, you’re wrong. I guess the international art market is getting to be the same way.